What is a Chain Driven Live Roller Conveyor? CDLR conveyor systems are the workhorse of the conveyor range, and one of the most common floor-supported styles in use. Chain driven live roller conveyor systems (CDLR) are ideal for transporting medium to heavy loads at controlled speeds for many industries. Typical loads that CDLR conveyor moves include loaded pallets, tires, drums and totes. 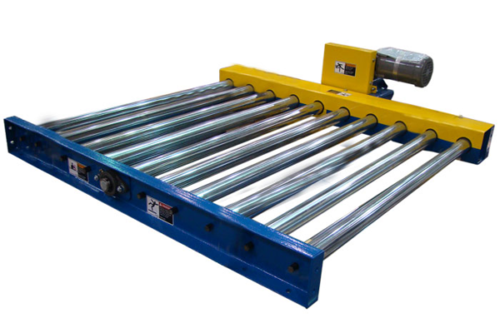 When used to transport pallets, they are frequently known as pallet roller conveyor systems. They are easy to maintain, and can take a lot of abuse without damage. Rollers may be mild steel, galvanized or stainless steel for special applications. Where impact loads are possible, thicker gauge roller material and upgraded bearings will be specified. One of the advantage of Chain Driven Live Roller Conveyor systems is that the allow the product being moved on them to accumulate (i.e. nest alongside each other while the line continues running). This creates a buffer system, where the line can be maintained in a full state. Where it is necessary to singulate the loads again, a device known as an escapement meters the products out from the flow on the conveyor to release them one at a time. 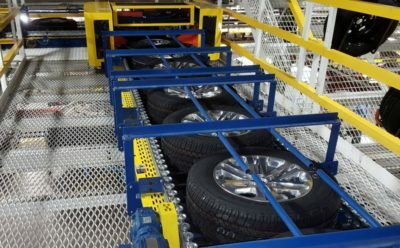 Delivery systems inside assembly plants are therefore a very common application for products like seats, wheels and tires, pallets and other products that ride on containers with smooth surfaces underneath. Where CDLR conveyors are used as pallet roller conveyors, it’s common to use loosely fitting plastic “slip sleeves” over the rollers. These let the pallets on the pallet conveyor accumulate against each other in a stationary position while the rollers of the pallet roller conveyor continue turning underneath. 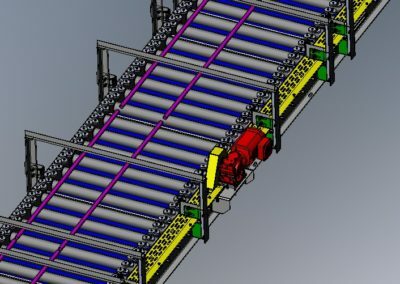 Why Use CDLR / Pallet Roller Conveyors? The sprocketed rollers and roll to roll chain system provide positive driving power to the product. 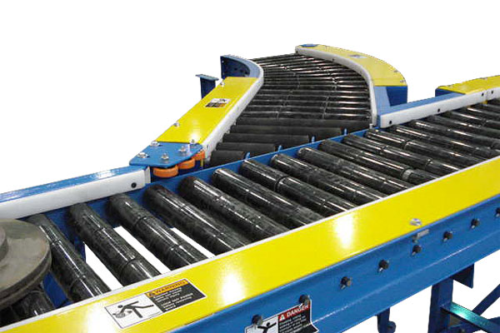 Multiple lengths and configurations make the CDLR a versatile conveyor. 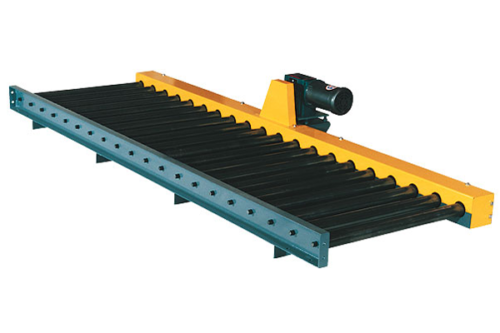 The chain driven live roller conveyor design also makes this conveyor suitable for oily conditions which other conveyors may not be suitable for. CDLR systems include straights, curves and square 90 degree corners. Pop-up transfer systems allow loads to move off the main conveyor at a 90 degree angle, for example where one wheel goes to one side of the line and the next wheel goes to the other side. Lengths from 1 ft. – 12 ft. When you buy a turnkey chain driven live roller conveyor system from Ultimation, we design, build and install your system according to your requirements. You can be confident that our engineers have checked your requirements fully, and that we understand the necessary mechanical and electrical requirements. Where overhead platforms are required, we design and fabricate those support structures as well. Registered Professional Engineers analyze and check that the support structures are suitable for the system static and live load. 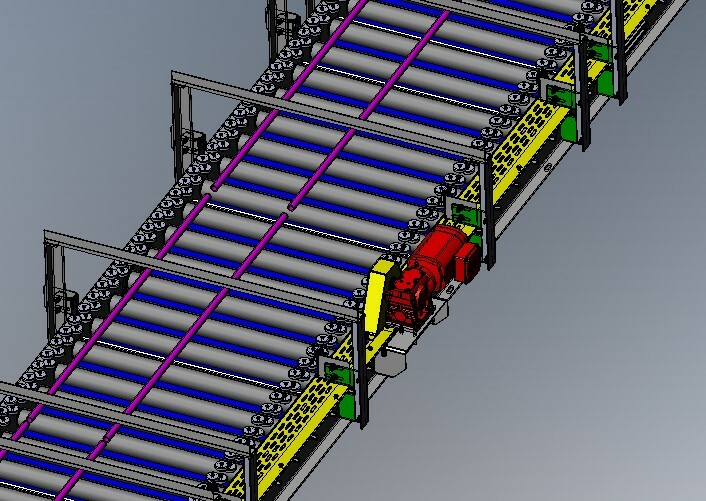 All our product design for pallet roller conveyors is completed in 3D CAD software, enabling you to view the product at the approval stage.